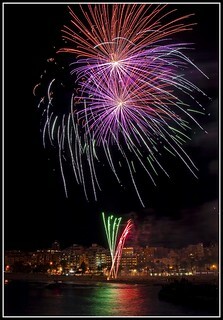 This page is a guide to fiestas in Benidorm Spain. Fiesta is the Spanish for festival, basically it is one giant celebration and party often with fireworks. Try plan a visit to Benidorm to coincide with one of the many fiestas for a glimpse into real Spanish culture. Spain is famous for its fiestas and Benidorm does them proud. Benidorm is probably the party capital of the Northern Costa Blanca. The Spanish love nothing more then their fiestas and each tourist resort has their own fiestas just unique to them. A lot of time and tax payer’s money is spent on fireworks, as much as one million Euros are spent on the annual September fireworks. We start the calendar year on the 5th of January with the Cabalgata de Reyes which is the Three Kings Procession. On January the 17th there is the Fiesta de San Antonio Abad which is the Fiesta of Saint Anthony Abbot. During the month of February there is Carnival which celebrates the funeral of the sardine much done in the style of Rio de Janeiro featuring processions, fancy dress, and live music and dancing. On March the 16th the statue of the Virgin is taken through the streets of Benidorm’s Old Town commemorating the finding of the Virgen del Sufragio. On the days of March the 16th through to the 19th of March are the famous Fallas which has become one of the most important fiestas in Valencia and Benidorm. This is the festival of St Joseph the carpenter. It started as a contest between carpenters to create an effigy of the saint and it has now become a competition between municipalities creating paper Mache monuments in the shape of hundreds of Disney like cartoons rising 50-100 feet in the sky based on current affairs figures of importance. Hundreds of thousands of Euros are spent each year in building these monuments which are then all burned in the finale. Participants wear elaborate costumes taking part in street processions, fireworks and live music. St Patricks Day is also a popular fiesta in Benidorm although not an official one, most pubs will have some form of entertainment and the Guinness will be flowing freely. The Benidorm Easter celebrations are either in March or April. The Easter week is celebrated with sombre processions with an effigy of Jesus on the cross being carried through the streets of Benidorm by mourners wearing black and candles. During the month of May is the Fiesta de la Creu which is on May the first in the Foietes District. It is one of thee most traditional fiestas and begins with the Vestida de la Creu which gives way to the ringing of the bells, parades and a floral offering in the streets of the Old Town. From June the 22nd until June the 24th there is the Hogueras de San Juan Bonfires of Saint John which consist of bonfires in three districts of Benidorm which are in La Cala, El Campo and el Mercado. Also in June are the Benidorm Song Festival and the Romeria Del Corpus which literally mans the gathering of corpses. This is a vibrant fiesta which takes place over a three day period where the participants are dresses in Andalucía costumes taking part in dances and processions, horses and fairgrounds. During the main holiday season of July and August Benidorm’s entertainment is made up of concerts and classical opera and ballet as well as theatre performances by international pop groups and artists as well as Spanish performers. In September is the festival of Asturias celebrating the grape harvest and the festival of the House of Castile La Mancha, while the last week of September celebrates the fiesta of the Moors and the Christians. This festival has its roots in the conflict and lives of people during the 13th to 15th Centuries during the Moor occupation of Spain. People wear colourful costumes and reenact thee battles between the two warring factions. The dates for this festival vary as sometimes the fiesta is held during the first week of October. On October the ninth Benidorm celebrates the day of the constitution and until the 12th of October is the festival of the Rosebush. The best known fiestas are the November fiestas in Benidorm when many people visit especially for the gigantic celebrations. During November fiesta week Benidorm celebrates a fiesta for its patron saint which takes place over a full seven day period where the town virtually shuts down and takes part in the celebrations which last all day and night every day! Included in this week-long fiesta are processions, dancing, live music, dancing in the street, sporting events and stunning firework displays. The Patron Saints of Benidorm are the Virgin of the Suffrage and St James the apostle. Not to be missed are the staging of finding the virgin, the flower offering, the parades and great firework castle which takes place on the very last day of the festival. The third week of November sees the Festival of the Artichoke or better known as the Festa de la Carxofa. If you are coming especially for the Benidorm November fiestas then find out what the weather is like in Benidorm in November. During the month of December there is a festivities programme taking place between the 20th and 31st of December. The New Years party is better known in Spanish circles as the Fiesta Cotillon which takes place in front of the clock in the square where you may enjoy free champagne and live music. The Spanish tradition of the counting in the New Year is to eat twelve grapes eaten on the stroke of midnight which is meant to give you good luck for the coming year. Benidorm sure does provide its fair share of fiestas, festivals, concerts and parties giving it a more than deserved reputation of being the party capital. Benidorm Fiestas – Page Summary– This page covers the main festivals known as fiestas held in the town of Benidorm on the Costa Blanca coast of Spain. 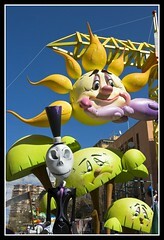 If you plan to visit Benidorm try coincide your visit with one of these events.